This is the LED ignition light I made in order to better see the ignition switch in my 1994 Miata at night. 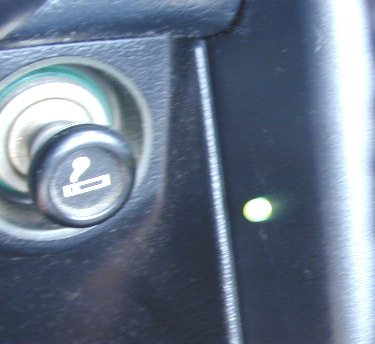 The light is designed to to provide just enough light to see the ignition switch at night. It's activated by opening either door and stays lit for approximately 10 seconds after the doors are closed. It sticks out of a hole I drilled in the center dash, directly across from the ignition switch. I used an LED light for three reasons. 1) An LED draws less current, making it easier to make t fade out after the doors are closed. 2) Some modern LEDs are hella bright. 3) They have this handy flange at the base so all you need is a hole to stick it in and you're done. You could theoretically use a regular flashlight bulb or interior lamp, but keeping it lit after you close the door will be harder since it draws so much more power. Realistically, you would want to use a real delay circuit, not just a capacitor like I did for the LED. If you already have one of those cool interior light dimmer things, then just use that. Here is a diagram of the circuit. When power is applied, it instantly charges up the capacitor and lights the LED. When the power is removed (you close the door) the LED continues to be powered by the charge in the capacitor for a number of seconds. The bigger the uf rating of the cap, the longer your light will stay lit. I connected mine to the passenger footwell light as a power source. In order to do this I also had to connect a diode. This keeps my circuit from trying to power the footwell light when you close the door (which it wouldn't do very well). I didn't note this in the circuit diagram since you are free to connect yours to what ever source you like. The resistor. This must be in place in order to keep the LED from burning out. I used something around 150 ohms. If you apply current to an LED without a resistor in place it will be runined in the flash of an eye. By using Ohm's Law (look it up yourself) you can determine how much current will go through your LED based on the resistor. Make sure you aim for something within the LED's rating (if you know it). 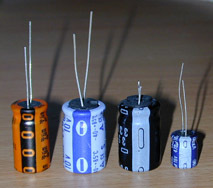 Each of these capacitors is showing you it's negative side, based on the stripe and/or series of negative signs (-). The door switch. So that you can use the interior lights without the door open, the door actually provides a switched NEGATIVE source, not positive like you would expect for most other circuits. This is important since both your capacitors and your LED need to be connected the right way in order to work. Next page to see pictures of the light going in the center console.